There are periodically new entrants to the DNA testing arena and, when those new entrants appear, the one thing The Legal Genealogist wants to review is their terms and conditions. So with the surge of interest in LivingDNA — a relatively new British company offering (at the moment) only ethnicity and geographic locating finding — it’s time to look at terms and conditions there. 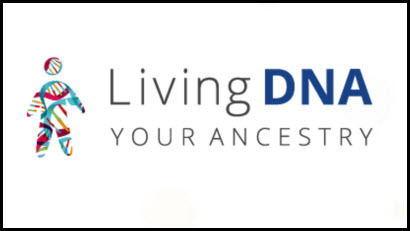 At the moment, LivingDNA’s test is best described as a “biogeographical ancestry test.”1 It’s aimed at identifying ethnic origins and placing your ancestors within a localized geographic area. It’s focused on the British Isles at the moment, with plans to expand to Europe and beyond, and it also plans on offering cousin matching in the future. One thing that isn’t clear on the LivingDNA site is whether testing by itself constitutes an opt-in to the research projects the company intends to undertake. It sounds that way, on the Research Consent page: “At Living DNA we offer customers the ability to find out more about themselves by paying for DNA testing services. While this is our main business model, we also want our services to benefit society as a whole; for example, by research that helps us understand more about our global population make up and health.”17 The page then says we can “opt out of this project at any time”18 but without saying specifically how. This part of the terms really needs to be clarified. There are a few clauses in the LivingDNA terms that I haven’t seen in other companies’ DNA testing terms. One is the requirement that you send a test sample in within six months of buying the kit.19 With other companies, you can stock up and buy kits when they’re on sale and use them as needed. Not with LivingDNA. So… bottom line… read the fine print. If you’re okay with the terms, go ahead and test. If you’re not comfortable with what the company requires, don’t test. There really isn’t a third choice. Glad to hear there will be more clarity down the road, David. I wish the test went back more than ten generations. For those of us with early New England ancestors, that’s not far enough! Judy, As has been pointed out in a comment in the ISOGG Facebook group (https://www.facebook.com/groups/isogg/permalink/10155391042402922/?comment_id=10155391425032922&comment_tracking=%7B%22tn%22%3A%22R2%22%7D), there is no such as British law. Britain includes England, Wales and Scotland, but the term British is often used to cover all the constituent countries of the United Kingdom which also includes Northern Ireland. Scotland and Northern Ireland have their own separate legal systems. Living DNA’s terms and conditions clearly state that “any dispute or claim arising out of or in connection with it [the Living DNA test] will be governed by English law”. Thanks for setting this American straight.